Mayor Mike McGinn and King County Metro General Manager Kevin Desmond today announced the City of Seattle is buying more than 5,000 hours of added service per year through early 2016 on nine high ridership bus routes in Seattle. Using $750,000 in savings from the voter-approved Bridging the Gap Levy, the City of Seattle is able to help Metro increase evening and weekend frequency on high-ridership routes from 30 to 15 minutes or from 60 to 30 minutes. “It’s great to be able to add this service at a time of ridership growth,” Desmond said. “Every bit counts, but solutions are still needed to sustain service for all of Metro’s riders.” As temporary funding expires and reserves are exhausted, Metro faces a $75 million annual shortfall. The routes benefiting from this temporary boost in service are the 5, 10, 21, 40, 41, 48, 49 and 120. Presumably the hope for when this money runs out in two years is either that Metro will be on a firmer financial footing, and able to fund these trips by itself, or that another BTG package will be authorized by Seattle voters. A separate, permanent 5,000 hour boost in service will come from Metro, paid for by Transit Now. As I understand it, each jurisdiction that has made significant investments in transit speed and reliability for a RapidRide route gets a bonus of that size, which they are allowed to spend on core routes of their choice. SDOT has evidently chosen to spend it on the E Line, which will need all the help it can get. As the news release notes, the quantity of service hours purchased here is not enormous, certainly not compared to Metro’s structural budget shortfall. 5,000 is hours is not adequate to launch a new service, or a major expansion in frequency on an old service, but it’s enough to pay for a handful of new trips per day on a handful of routes. 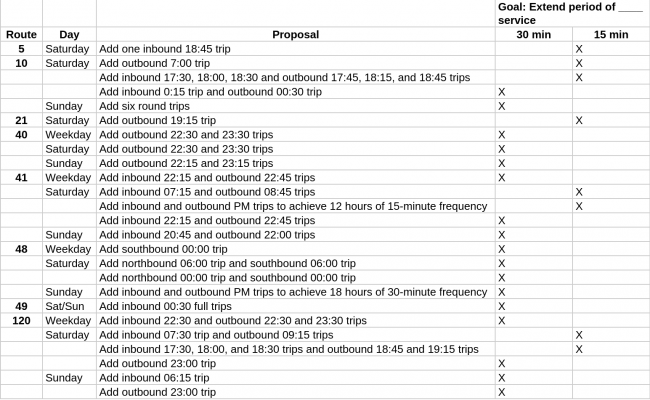 As part of the Urban Village Transit Network plan, SDOT has a policy goal of achieving, on weekdays, 18 hours of 30-minute service, and 12 hours of 15-minute service on UVTN routes; SDOT is using this money to fill gaps in the schedules of Seattle’s highest ridership routes, to bring them closer to that goal. The more often a bus runs, the more likely it is to be used by people who have other options, and the more convenient that bus is for all riders. This improvement package is designed to extend frequent service to run for more hours on some of the highest ridership routes in Seattle. In some cases, when bus frequency drops from 15 to 30 or from 30 to 60 minutes in the late afternoon or evening, there are issues with overloaded buses, and SDOT expects this package to address some of those issues. 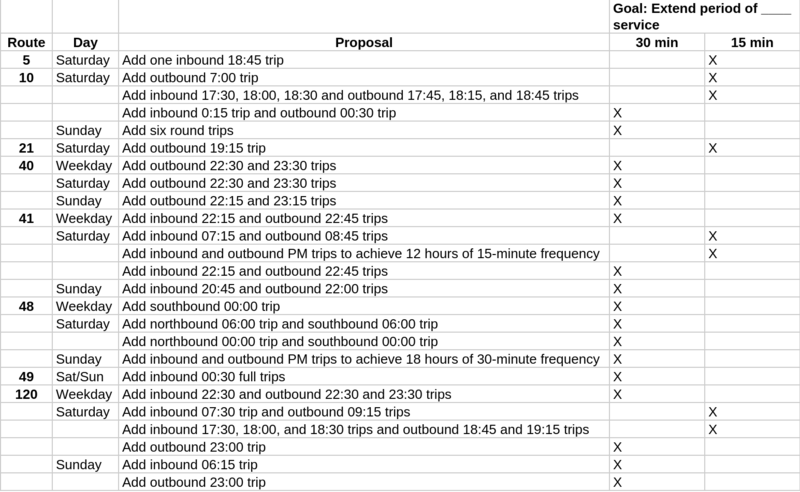 Below is a complete spreadsheet of proposed changes; it is preliminary, and subject to final costing work by Metro. While the most notorious problem this will fix is night service on Route 40, perhaps a better example of how this will improve overall usability of the network is Route 10. The current schedule has a raft of irritating off-peak quirks: frequent service ends at 5:30 PM on Saturdays, rather than around 7 PM, as on the rest of the frequent transit network; Sunday morning schedules are hourly (!) until 9:30-10:00 AM; the late-night Saturday schedule is a mess, with two trips running within 15 minutes of each other, then a 45 minute gap. SDOT’s proposal would fix all of these, and in certain cases it’ll do so extremely cheaply, as all it may take is rescheduling a deadhead trip. With this proposal, SDOT again demonstrates that they grasp what makes transit useful: frequency and span of service on high-performing core routes, throughout the city. As with all of the bus improvement work coming out of SDOT these days, my only complaint is that there isn’t more of it. I greatly appreciate those added outbound Rt 40 trips. But think of all of the dozens of inches of rail we could have bought with this money! I went to check the late night schedule for the 40 and noticed a new, pretty schedule page on Metro’s website. Did this just happen or have I been out of the loop? The maps are still pretty crummy though. This is how progress gets made: one trip at a time. Keep doing this on every possible occasion and eventually you have usable frequency. A minor quibble: The only reason the 40 problem was more “notorious” than the equivalent 120 problem, which this package will also thankfully fix, is that more of the people who tend to write articles and blog posts about transit service problems live along the 40 than the 120. The 120 trips will benefit more riders. There’s quite a bit of truth to that, and I’m conscious of the geographic biases of this blog :-) The other issue here was that pre-restructure 17 service was every 30 minutes until close, so on that corridor, the 40 was a downgrade late at night, even though it was a major upgrade for the rest of the day. I greatly appreciate those added outbound Rt 120 trips! I’ve been on late-evening trips (when the route is running hourly) with standees; artics, mind you. I don’t discount the need for these added trips (and I thank the mayor for doing this), but I still believe one-time money is best used on capital improvements that yield operational savings in perpetuity. In that regard, has SDOT done all it can to reduce travel time and improve reliability on these lines? Agreed. The D line still has many queue jump lights that either aren’t working well (Columbia St’s lights are barely usable – I end up merging in with general traffic) or are non existant. I’d nominate W Mercer & 3rd Ave W heading Eastbound for one, but I’m sure Metro has better data. In general (I can’t speak to any in particular), a lot of the crappy queue jump/TSP configurations are due to a lack of staff time, not money. It takes quite a bit of signal engineer time and interagency coordination between SDOT and Metro to setup and optimize each one. SDOT has been on a rampage of installing TSP, and last I heard, there was a backlog of work to tune them. The Mercer/3rd queue jump idea has been around for quite a while, and is on the list. I can’t remember when exactly it’s expected to go in. You know one thing you can do with money? Hire more staff! This money was not available for hiring staff. It was only for operations and capital. In what world is paying people who are needed to work on capital improvements not an eligible use of money budgeted for capital expenditures? Oh wait…this is the government we’re talking about, never mind. I have to say I’m in Brent’s camp on this. I’d rather spend the money on the many TMP corridor improvements that will last forever. There’s a decent chance the legislature does the right thing this year, in which case these contributions will be totally inundated by the new money, perhaps diverting Metro funds to something less productive. In all seriousness, Martin, even the most vital infrastructural improvements cease to matter if your system fails to meet a baseline standard for “transit service that exists when you need it”. These 5000 distributed hours represent quite literally the least we can do toward achieving the sort of mobility freedom that makes corridor improvements of use to anyone. And we’re going to much more easily reach that threshold if existing trunk lines (like RR D) are fast enough to be a good option at all times of day, and service hours aren’t frittered away stuck in traffic chokepoints. However, I’ll confess that I’m stating a general principle, rather than any careful analysis of the options with this particular pile of money. And in any case, bus hours are hardly the worst thing in the world, and I won’t let the perfect be the enemy of the good. I share the general preference for capital expenditures, and it’s worth noting that SDOT could have chosen to blow their whole wad on peak trippers (which would indeed sit in traffic), but chose not to. Instead, they chose to mostly spend money on what I think is the single biggest obstacle to car-free living (outside the Rainier Valley and a few other places), namely the lack of transit that runs at least somewhat frequently in the evening. Many of Metro’s peak trips are (over)crowded, but Metro can still do a pretty good job of getting you to the urban centers for work; it’s the evening where Metro fails much of the city. Martin, I am increasingly of the opinion that the Uptown Detour — which constitutes 40% of the run time between Market and downtown, in both directions, day or night — cannot be solved without eliminating it entirely. 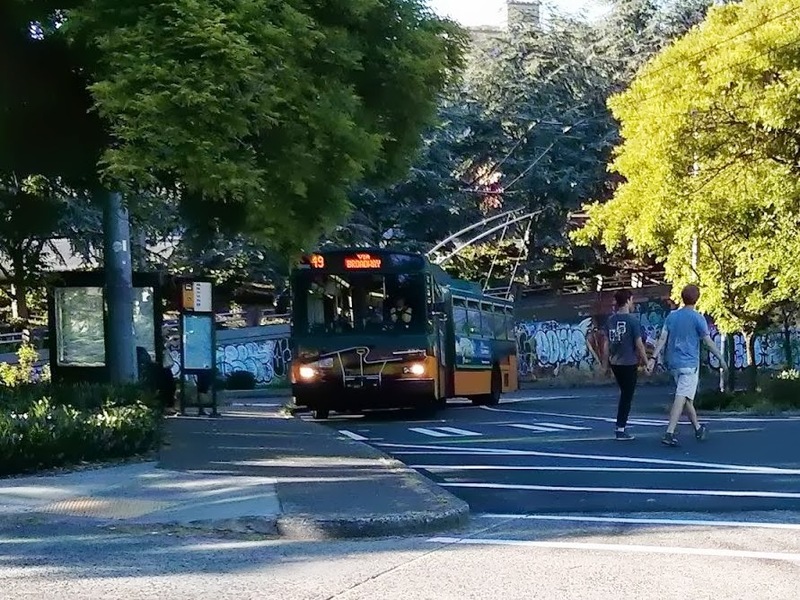 As long as RapidRide remains imperceptibly faster than any alternative, fails to achieve spontaneous-usage frequencies at any time outside of rush hour, and itself drops to headways of 30-40(!) minutes before 11pm, it cannot be treated as a trunk line worth walking distances to. At least not without making a mockery of the kind of mobility you would claim to be working to enable. Until there is evidence of a real commitment to effective trunk services, rather than lip service, I will support targeted schedule gap-filling like this for proven all-day services. Oooh, I really like those fixes for the 10 – it just makes it makes sense, which I think will benefit riders (and ridership numbers) all along the corridor. Personally, I also like it because the times I am tempted to ride the 10 (as opposed to biking, don’t worry) occur when I want to shop downtown on weekends, but the schedule has made that pretty inconvenient. This helps me a lot! The 71-73 combine for four trips per hour each way up to 1 a.m. The tails could certainly use more evening frequency. I agree that this would mesh well with the run-up to U-Link, if Metro comes into more money. Unless I missed it, the post doesn’t say when these extra trips will be rolled out. Is there any chance of adjusting the trip times so that the half-hourly 40 is staggered against the half-hourly RapidRide and the half-hourly 28, rather than having all three come within 8-10 minutes of each other? Bonus points if Metro can get the evening trip times standardized all seven days of the week. Making Sunday trip times consistent with the rest of the week would require a renegotiation of the union contract to allow for Sunday combos. Right now all Sunday work has to be straight-through, which would make for a lot of waste if you used the Saturday schedule. Yes, it’s pretty dumb, but combos are also pretty brutal. A split shift. Metro uses them on Saturdays to allow individual buses to stay out for lengths of time (e.g., 12-13 hours) that don’t divide well into full 8- to 10-hour runs. (They are also used on weekdays because the contract doesn’t allow Metro to have as many part-timers as it would need for that purpose and to run peak-hour service.) On Sundays, a bus staying out 12-13 hours means that one or two operators are getting paid not to work, so the schedules have to be tailored to keep buses out for 8-10 or 16-20 hours at a time. This results in differing frequency and different trip times. That’s pretty silly. When’s the current contract up? Are all shifts required to be in 8- and 10-hour installments, outside of combos? Full-time drivers (everyone driving on weekends) are guaranteed 8 hours per day, and most get paid overtime for everything over 8 hours. A few drivers receive “4/40” schedules where they pick only four days of work, but are guaranteed 10 hours and do not get paid overtime until they exceed 10 hours. So Metro tries, not always successfully, to ensure that most runs are as close to 8 hours as possible and 4/40 runs as close to 10 hours as possible. Obviously part-timers and full-timers doing combos seriously increase flexibility under these circumstances. I wouldn’t count on the Sunday no-combo rule changing anytime soon. It’s always something Metro wants, and always something the union digs in on. I’ve never understood the resistance to adding PT work to weekends. I’m sure allowing Metro to schedule PT drivers on weekends would result in more Sat/Sun days off. Do FT drivers really want to work weekends that badly? I think it’s just the same reflexive hostility to the concept of part-timers that you see from the union’s old guard in many circumstances. It’s often counterproductive. Just create an overall limit on the number of part-timers, stick by it, and let Metro schedule those part-timers however it sees fit. Having once picked work (my first full shakeup as a full-timer) that had 4 combos and a run only on Sunday, I actually have a lot more sympathy for the no-combos-on-Sunday rule. That was an absolutely brutal schedule I’d never want to go through again, and it didn’t even get me any significant amount of overtime. But, of course, using part-timers on Sunday would make it a lot easier to avoid using combos. If there’s a good chance the legislature won’t create more sustainable funding for Metro, I would have used these funds to stave off cuts, even if for only one shakeup, rather than boosting routes now. If the legislature will save Metro, I’d only perform frequency and span boosts that Metro would eventually keep permanently, except those that will be rendered irrelevant by capital improvements like Link and the FHSC. If these boosts are eventually going to go away (except for those adjustments that are just SDOT smacking Metro upside the head for their boneheaded scheduling, like some of the 10 weirdness), I can only imagine they’re doing it to build political support for Metro’s plight. As I note in the post, the magnitude of the 17% cuts dwarfs, by multiple orders of magnitude, the added service here. To be more specific, Metro has to plan to cut $75 million in its annual operating budget. This money is $750,000 spread over three years. Do the math. This city donation to Metro pales in comparison to just about anything else Metro could do to save platform hours, including instituting a cash surcharge, allowing non-corporate-junk ads on buses, or eliminating the 61, just to name a few examples. Indeed, eliminating the 61 (just to pick on one random underridden and nearly pointless route) could backfill a bunch more of these missing evening trips or even allow early morning trips for those who open the stores for the latte shifters. Or, as I pointed out earlier, it could be spent on things that reduce travel time for every trip on a given route, in perpetuity. But then you would be acknowledging that it’s not a revenue problem’; it’s a spending problem. Metro has zero incentive to work efficiently when it means cuts to their existing management staff. OTOH, management staff has every reason to cut service in order to keep their jobs safe and promote the perception that the agency needs more money… Inmates running the asylum. Bernie, reflexive comments like that look very uninformed in light of the significant management cuts Metro has undergone since 2009. Lots of talk about this supposed revenue crises from sales tax funding; 2010 $373,092,691, 2011 $397,576,059, 2012 $411,906,300, 2013 $420,644,678, 2014 $437,540,182, 2015 $460,960,235, 2016 $486,822,765. That’s an increase of 22% over 6 years; almost double the rate of inflation. Fare revenue projections are for an 18.5% increase. Property tax revenue for transit has been flat but that’s contributes less than 3% of total revenues. So where’s the crises? It’s all because of a projected decrease in grant revenue, primarily State sponsored mitigation for SR520 and SR99 construction. The threatened decrease in service is actually a ploy to permanently add the windfall Metro’s received onto the already generous amount paid by King County residents. I can’t speak to the weekend 5, but I can only imagine that route is popular between downtown and Phinney Ridge/Greenwood. North of there, the 5 seems to be pretty barren. When I heard the 41 was the victim of the budget ax, I cringed. To avoid the early afternoon 358 (if I don’t want to take the 301), I often squeeze into the 41 to Northgate and the 348 to Aurora/N 185th. It’s a nice expeditious route to the North end of town. Glad to my alternate to the 358 is getting some added service. Good changes, but I was really hoping the 48 news was going to be 15 minute service at least part of the day on Sundays! As previously the highest ridership route in the Metro system, and now probably still in the top 10, it deserves frequent service every day of the week. Added service on the 21 is just unacceptable. I ride the 21 Monday thru Friday & it pains me to see all these empty buses all day long. I ride the 132 frequently too & its always crowded.